Find a book that reflects the lit character of the area at The Inn Above Tide in Sausalito and The Laurel Inn in Presidio Heights. Reader love: Find a book that reflects the lit character of the area at The Inn Above Tide in Sausalito and The Laurel Inn in Presidio Heights. PAGE AND PLACE: Few beds are made for lounging like a hotel bed, with its plush assortment of pillows, and few activities go as well with languorous lounging as reading. This double pursuit, lounging and literary enjoyment, sits at the top of many a favorites list, though how often we do both at home is up for debate given our forever busy, on-the-go days. That's why we look to vacations, and overnight getaways, as prime reading time, a sort of stepping-out-of-routine route to jumping into a story or a work of nonfiction. Two hotels are upping that literary longing, and they're doing so by highlighting those bookly works that focus upon the area or area's authors. San Francisco's The Laurel Inn and The Inn Above Tide in Sausalito recently introduced book programs for guests, and while each are a bit different, both share a love of story, of local texture and tales, and of providing a relaxing respite for guests. A BOOK BUTLER PROGRAM... is available at The Inn Above Tide, thanks to Book Passage Sausalito, which is but a pleasant stroll away. A quartet of hardcover titles is chosen bimonthly, and guests can purchase one of these titles for a cool 25% off and have it delivered to their room. An alternative, just as nifty? Inn guests can nab 10% off anything at Book Passage Sausalito, should another title catch their fancy. And at Joie de Vivre's The Laurel Inn in Presidio Heights? Books Inc. Laurel Village is the page-fabulous partner, which means a 20% discount on books for guests of the Inn (or the chance to read a book, and return it, during their stay). Like any great tome, there's more to these tales, like an online book discussion group via The Lauren Inn stay. The exciting epilogue? 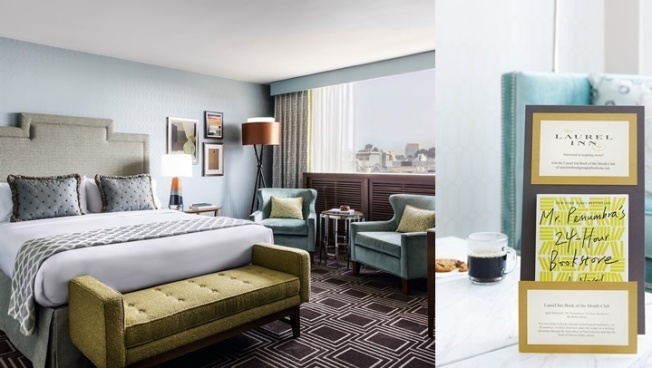 If reading is a passion, and lounging and lit love your favorite pursuit, you've got two stay-over spots who want to connect you with characters, bookstores, other readers, and the concept of thrilling escape, both in hotel form and in page form, simultaneously.